Oak Harbor, WA, (pics) is located on Whidbey Island in Western Washington alongside the Strait of Juan de Fuca. At 55 miles long it is one of the longest and largest islands in the contiguous United States. The island is home to the Naval Air Station Whidbey Island. The town of Oak Harbor is located on the south perimeter of the Naval Air Station with many of its residents economically related to it. The Dutch were among the early settlers of Oak Harbor and you can still see that influence in some of the architecture around town. After leaving Vancouver, we spent a few days on Whidbey Island. Deception Pass is a strait that separates the north end of Whidbey Island from Fidalgo Island. 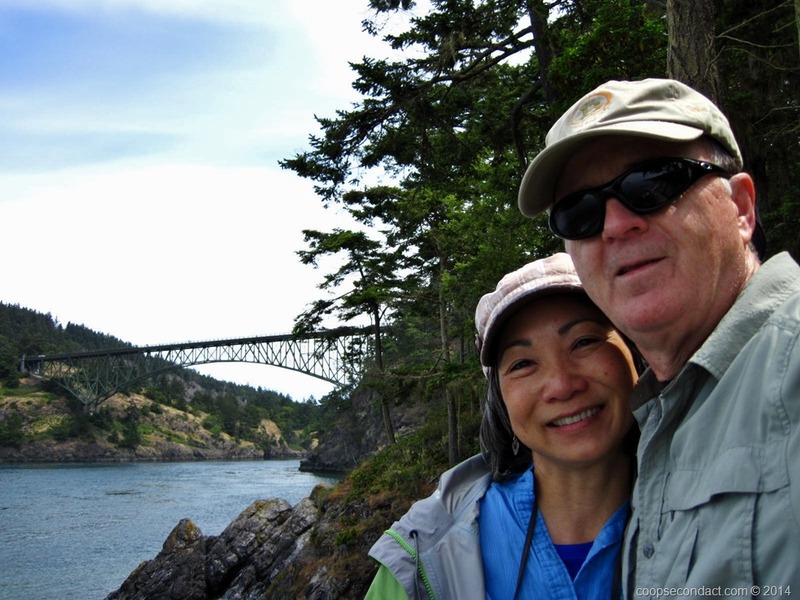 The Deception Pass Bridge spans the strait and is one of Washington’s most scenic bridges. It is such a narrow strait that early explorers who were part of the Vancouver Expedition failed to locate it initially, leading them to conclude that Whidbey Island was a peninsula, thus its name. During ebb and flood tides the narrow strait causes the tides to form whirlpools and rapids making passage difficult. On occasion the tides result in class 2 or 3 rapids in the strait. The land on both sides of Deception Pass are part of the Deception Pass State Park.